I don't see any recent threads, so let's get one going! I picked up this nice Redskins [can I still say that or is it now the "R" word?] cover of HOFer Bill Dudley. exhibitman - Get Redskins cards while you can, now. Ebay has a tendency to overreact in cases like this. I can fully see them banning anything with the word "Redskins" in the title or description. They've done it before with collectible Nazi Germany items, as well as banning items with the word "Cuba" in it because of the embargo, which included things like 100 year old stamps, coins and postcards. Just think of all the cards and memorabilia that might be banned because of this. BTW, nice REDSKINS cover. I have a Sammy Baugh from that same set. NewEnglandbb.. - Love the 57's! In my opinion vintage football represents some of the best bargains around. Picked this up yesterday, the last card I needed to finish my '64 Topps set! Cut in half sure, but it's a genuine John Unitas rookie! Larry, congrats on completing your 64 set. I'm only a little over 60% complete on mine. About the '57 "half" card. Funny (or sad) story: A few years back, at a local mall card show, I came across a dealer who had a pretty big stack of 1957 Topps cards that were cut in half, like your Unitas, sitting in his showcase. He wasn't a regular football guy and had no clue what they were. He really thought they were small sized football cards, until I showed him some of the same 57's, that I had bought at another table, that were not cut in half. I wasn't trying to be mean or nothing, I even waited until no other customers were lingering around to tell him. When he realized it you could tell he really had no clue, and I'll bet he paid some pretty decent money for them. You could just tell, he looked so disappointed. I've been out of town, and had the chance to visit a card shop while on vacation. Nice to have several hours to dig through a shop with plenty of vintage! 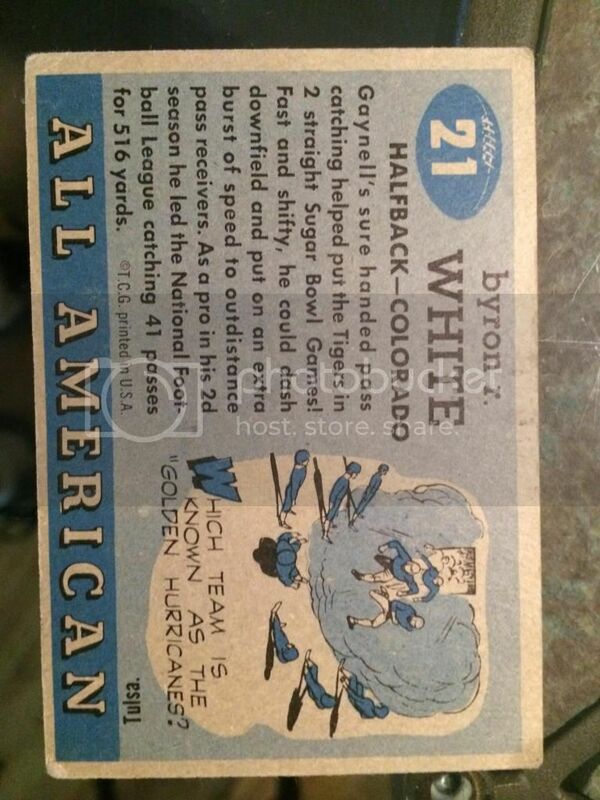 Last pickup was sitting there in the showcase 1955 Topps AA Whizzer White error with the Gaynell Tinsley bio. Only two cards remain and I will complete this set. DYN that after his football career Whizzer served as a Supreme Court Justice for 31 years? Whizzer died in 2002 in Denver, and this is where I picked up the card, Denver! Sure did. Back when I was in law school a friend of mine at a different school was invited to a dinner where White was speaking to students. I sent him my 55AA to get signed. He not only didn't have the nerve to ask White, he then lost the card. Adam all my "Whizzer" knowledge was gleaned today via Wikipedia Oh, and sorry your friend lost your card! Richard: I guess back in '57 cutting cards in two was the best way to double your collection! Picked up this W560 playing card of HOFer Ken Strong the other day. Been looking for this one for years! I just picked up the Michigan card this week, and got ahold of the Murad package in August. All I need is Colgate and I'll have my own personal T51 football subset. As a side note, I am continually annoyed that the T51 set seems to have included every college in the country except Carlisle. Won a lot of 48 Leaf at auction - low grade for sure, but I'm happy for the most part. Really nice Leaf cards there, gotta love the Leaf and Bowman sets from 48-55. Would love to eventually get some of the rookies from those years like Luckman, Tittle and so on but not cheap and starting to increase more and more as they should. Follow-up to completing the 1964 Topps football set: When I went through my cards I found I still needed #28 Booker Edgerson SP so I'm not done yet. I feel for you, Larry, but you'll finish it soon! Absolutely love the 57's especially the Van Brocklin and Tittle. Also those leaf's are great. I will be adding some of those to my collection some day soon. Here are a few of my latest football pickups. Just got the Landry and Griese back from a submission. I had picked them up at a local show. Nice cards! That Landry presents itself really well for the grade! Thanks Ty. I was hoping for PSA 5 on the Landry but I am very happy with a 4 as it is for sure a high-end 4. Ty nice additions with the Lane, Brown and the two 52 Bowmans. Larry congats on the 64 set completion, a great feeling no doubt. What set is next for you? Jeff P. I have that Ken Strong that you were looking for. I need to dig it out. I remember picking it up with a bunch of other cards a while back. Here is my latest football score. I had been looking at this one for a long time and was finally able to work a deal and land it. Nice Johnny U! I still need to get one of those someday. That's awesome, Larry! The '55 AA set is so cool. Congrats. Latest pickup from Sterling. Dah Bears! Back-to-back with Adam on another page too. The Ditka still looks great!!! 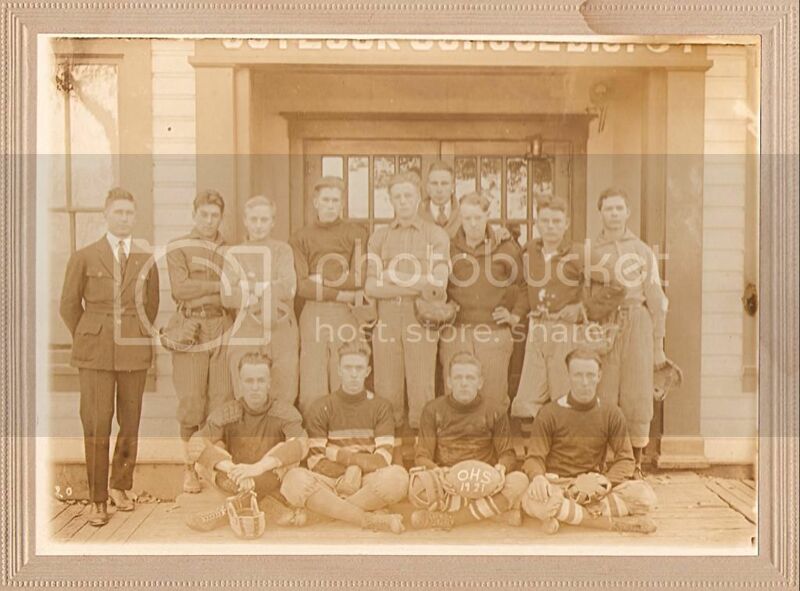 1921 Outlook High School Haymakers Football (Yakima, Washington). Just another pre-war local sports history piece. Only one player named on back. Very nice 64 Philadelphia Ditka. Card looks like it should be graded higher. Picked up this Bart Starr rookie to go with my recently purchased 57 Unitas rookie. Going into my Georgia Tech personal collection. Would have loved to be at this photo shoot, where they asked him to flex over a pile of fun house balls. Neat card, IMO. Just added this one. I had never seen it before, so I jumped on it. When you collect pre-war college football, you don't often get to see "new" inventory! Collecting Pre-War College Football, Jim Thorpe, & Early Olympics. Last edited by cmoore330; 11-08-2014 at 09:08 PM. Great pickups, everybody. Did you guys see the "A Football Life" on Ditka? It was pretty good. Casey: do you collect other pre-war football materials besides cards? Photos? Pennants? Charms? Etc? I'm a sucker for color lithography, so the bulk of my collection is that. In addition to cards and postcards, I have some magazines and tickets. 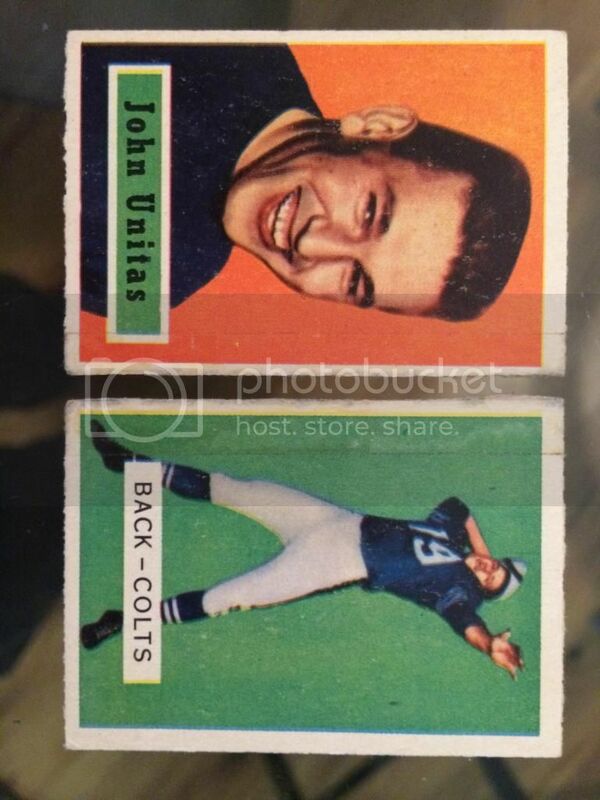 @JB nice Unitas r/c...that was one of my first cards i got when i came back into collecting a fews ago. I won this one in an eBay auction (It went higher than I thought in the last seconds - I thought I was going to get a deal, and in the end it turned out if I had sniped even a couple dollars lower, I would've missed it.). The low grade is justified with the poor centering, soft corners, light creasing, and the reverse isn't the cleanest. 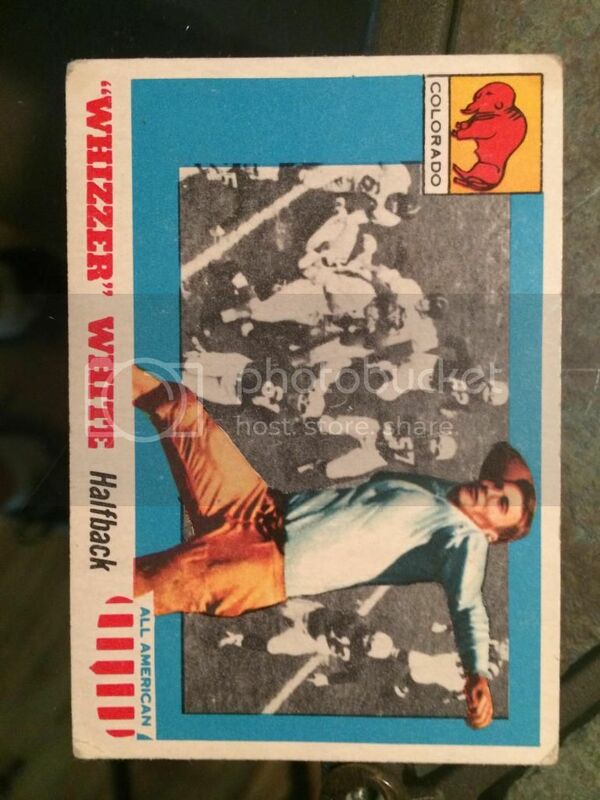 But, what attracted me to the card was the actual image is pretty well preserved with good color. I'm happy for the most part, although a 3 on a HOFer doesn't exactly help my registry standing. I'm down to 11 cards needed to complete the set and I actually need more low numbers than high numbers (6-5). This card arrived today via Ebay. 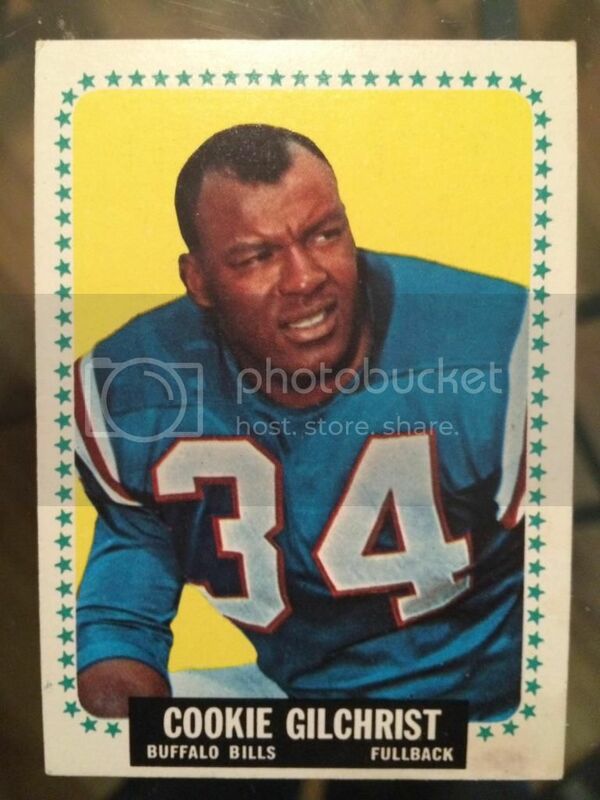 1967 Philadelphia #43 Leroy Kelly RC $8.50 delivered. I need just one more card to complete this set #29 Butkas. Nice pickups, Larry and John! 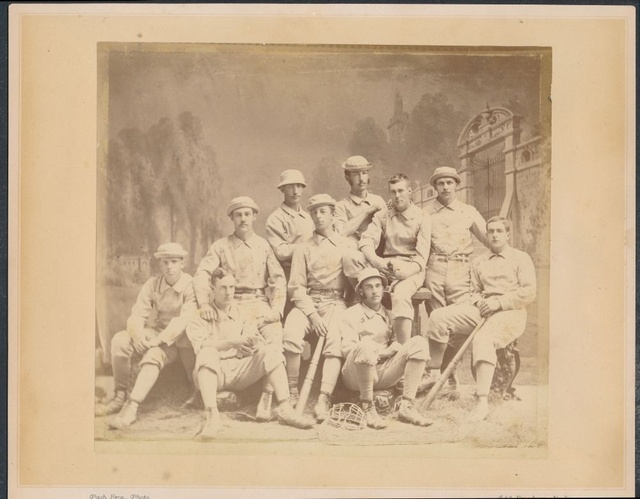 Forgive me for showing a baseball team but Walter Camp is the tall fellow in the back in this 1878 Yale Baseball cabinet. Nice Adderly. My favorite set. I'm glad this thread was revived, I have two I want to share. First, Deacon and Olsen look great side by side - just the way they played. And what set is the Adderly from? That's eye catching, but I don't recognize it. Both of these I've been chasing for a while. The Grange I won in an ebay auction - I'm sure the grade kept some away, but I think the main part of the image presents well - my guess is the paper loss in the upper right corner guaranteed the low grade. And it looks nicer in hand - the seller's image has a lot of glare. A lot of the Bednarik cards I've seen over the years have that same poor centering. I was glad to get one that has enough of a border to avoid the MC qualifier. I really like how bright the color is - it was my main Christmas gift which makes it nice too. picked these up on ebay.. trying to build/finish a '59 topps set Unitas .. and the Art Monk..just had to have it... the Adderly above is from the '68 topps set i think. Last edited by sockwell123; 01-07-2015 at 09:43 PM. Thanks guys. John, the Adderley is from 1968 Topps. Nice Grange and Bednarik. Thanks Adam. So it looks like the Packers and Raiders got special treatment in that set? Not sure, but it looks that way, at least for the Packers. I'm not completly up to speed on the 1968's as I'm new to vintage football. The Super Bowl II teams. Too bad they didn't do it across the board, would've made for a really nice set - reminiscent of the 55 AA backgrounds. Topps did these special cards for the Super Bowl teams which was a nice touch. My bet is they didn't do this design for the entire set because of the extra cost and Topps was very cost conscious. Until serious competition showed up in the late 80s / early 90s Topps didn't get creative and really take their cards to the next level. Nice one Phil, I had been watching that one. Very nice centering. Congrats. Congrats! That is a great looking JB rookie. Sweet Brown rookie, Phil! Congrats!